Cubans are smart, very smart. According to "The Fact Life," Cuba has one of the highest literacy rates in the world at 99.8%. Fascinating Information on Cuba and More: It is also interesting to note that Coca-Cola cannot be sold or purchased in Cuba… not officially. However, many restaurants offer the real Coca-Cola, but don’t officially advertise it. Furthermore, if you look on the Coke cans it does not say that it was made in America. Instead, the Coke sold in Cuba comes in cans from Mexico. Cellphones were not allowed in Cuba until 2008. Now, it looks as if half the population has one. However, the numbers are nowhere close to half the population. According to the Central Intelligence Agency, as of 2016 only 3.9 million residents had a cellphone and 1.3 million had a fixed land line phone. Internet usage in the country is scarce even today. Private citizens like the ones photographed are prohibited from owning computers or accessing the internet without authorization. Those visiting Cuba can use the internet if they buy a special card in one of the multiple government owned hotels. The card to access the internet has a special number on it that allows you to use your cellphone to jump online. The cost of the card is between $1.50 and $4.50 per hour of usage. Keep in mind, firewalls are in place so certain internet sites are no accessible (CIA Statistics). (Left photo) My 17 year old son and I were on foot and our goal was to find a locally owned restaurant in the capital. I approached the woman to ask, “How do I get to the old city,” which is what locals call Old Havana when they say it in English. I am not sure what she thought I asked as she sipped her coffee, but she pulled out a small soft cover book filled with language translations. She frantically thumbed through her book until she landed on a page about Jesus. Pointing at it, I read aloud. It was about finding Jesus and being saved. As I read she pointed down the street in the direction of a church. I smiled and thanked her and then started to walk away. She yelled for me to stop as she found a friend of hers that spoke English. With new direction, we were on our way. The Cuban people have a statue that most countries don't have... a statue of the late John Lennon from the Beatles'. Evidently, the statue was erected in year 2000 and reveled on the 20th anniversary of his death, December 8, 2000. Reports indicate Fidel Castro loved Lennon, despite Lennon having an open mind. Lennon now permanently sits on a bench in a Havana park. An article in the Atlas Obscura Castro stated, “I share his dreams completely. I too am a dreamer who has seen his dreams turn into reality.” The article further stated, “Lennon was also harassed by the US government in the later years of his life, and Cuba considers him a rebel and a victim; a kindred spirit to Cuba’s relationship with the US." 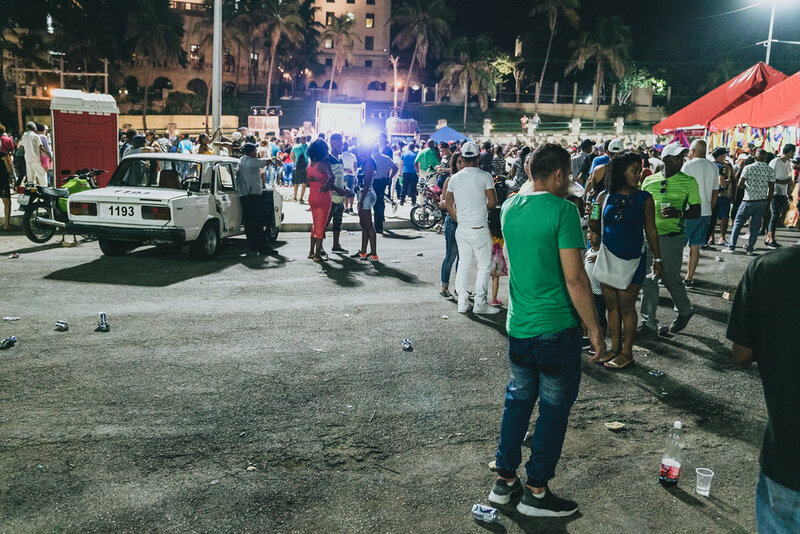 While on the subject of entertainers, Cubans love music and to dance. Despite the love, the government controls and owns all broadcast media. Total, they operate 6 national radio networks, 5 national TV networks. The government also operates multiple local radio and TV stations. In Havana for example, the main frequencies are 94.1 FM and 1260 AM. The AM radio station can sometimes be picked up throughout the South in America at night on AM 530.